If you’d like to sell for one day, then our Daily Rental is the choice for you. No advance reservations are required, arrive at the Main Entrance at 5:30am the morning of the sale. Day vendors are those vendors setting up, selling, tearing down and vacating the same day. We accept cash, credit and debit cards. SATURDAY NEXT AVAILABLE: A “Next Available” space on Saturday is $25.00 per space. Our parking crew will direct you to the next available space in the area we choose. This choice is the most economical and suits most vendors well. SUNDAY NEXT AVAILABLE: A “Next Available” space on Sunday is $30.00 per space. Our parking crew will direct you to the next available space in the area we choose. This choice is the most economical and suits most vendors well. LOWER PICK: Our Lower Pick choice allows you to pick a space anywhere from the Z13 row and below. To pick in the FLATS area, please see our Upper Pick Option listed below. SATURDAY LOWER PICK: A Pick Space on Saturday is $35.00 per space. This is for the vendor who is familiar with our market and knows the area they would like to sell in. Pick spaces are first come, first serve. No one may hold a pick space for another person. This type of space must be immediately occupied by a person, with product and a valid License Agreement. SUNDAY LOWER PICK: A Pick Space on Sunday is $40.00 per space. This is for the vendor who is familiar with our market and knows the area they would like to sell in. Pick spaces are first come, first serve. No one may hold a pick space for another person. This type of space must be immediately occupied by a person, with product and a valid License Agreement. Daily Vendors needing electricity will be charged $5 extra above the “pick” price. Saturday will be $40 & Sunday $45. UPPER PICK: Our Upper Pick choice allows you to pick a space anywhere in the FLATS (Z13 row and above). To pick in the lower portion of the market from the Z12 row and below, please see our Lower Pick Option listed above. SATURDAY UPPER PICK: A Pick Space on Saturday is $50.00 per space. This is for the vendor who is familiar with our market and knows the area they would like to sell in. Pick spaces are first come, first serve. No one may hold a pick space for another person. This type of space must be immediately occupied by a person, with product and a valid License Agreement. SUNDAY UPPER PICK: A Pick Space on Sunday is $55.00 per space. This is for the vendor who is familiar with our market and knows the area they would like to sell in. Pick spaces are first come, first serve. No one may hold a pick space for another person. This type of space must be immediately occupied by a person, with product and a valid License Agreement. Daily Vendors needing electricity will be charged $5 extra above the “pick” price. Saturday will be $55 & Sunday $60. 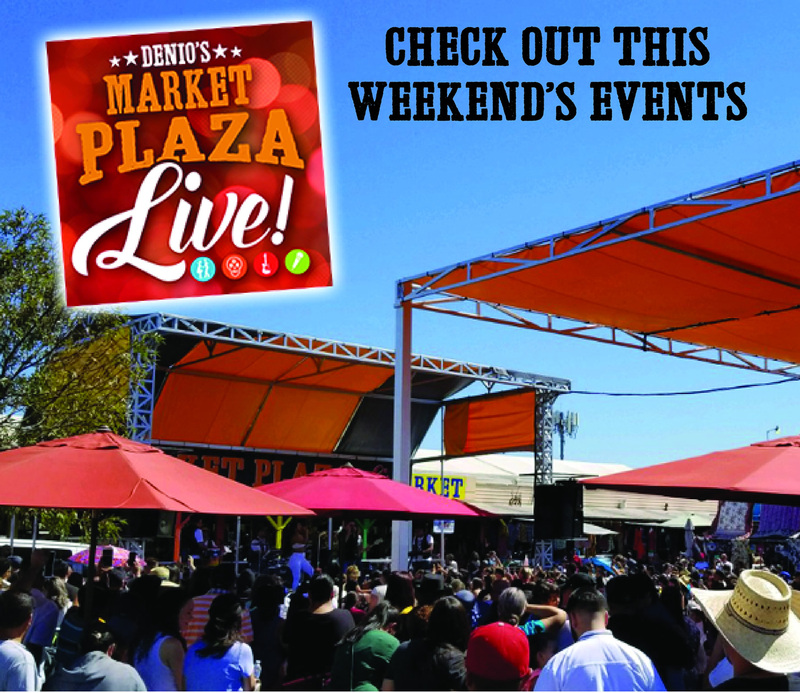 SATURDAY SPACE WITH TABLES: Denio’s has a select few spaces that are covered and have tables for your convenience. These are spaces we choose and are $32 per space per day on Saturday. Additionally, these spaces will accommodate most vehicles. SUNDAY SPACE WITH TABLES: Denio’s has a select few spaces that are covered and have tables for your convenience. These are spaces we choose and are $37 per space per day on Sunday. Additionally, these spaces will accommodate most vehicles. Our Friday market is about 1/3 the size of our Saturday & Sunday market and the buyers are just as ready to make a deal. The main gate opens at 8:30a for sellers and 9:00a for shoppers. If you are required to have a seller’s permit, bring it with you. Pick any available space in the designated “Friday area” and our personnel will come around and collect $12 from you, keep the receipt. If you would like to keep your Friday space for the weekend, come to the Rental Office at 3:00p on Friday to make your weekend reservation for Saturday and Sunday. Bring your receipt with you. Reservation rates for the weekend vary by location. The Main Gate (off of Vineyard Road) opens at 5:30am. For any new products, overstocks, close-outs, returns or plants. Any handcrafted merchandise (even if made out of old, used or recycled product). Anytime there are multiples of like-type items, new or used (for instance, all lawn maintenance equipment or all golf clubs-closing out business or reducing inventory). Anytime a person has exceeded 2 visits in a 12-month period (not calendar year). Produce, home grower or most food product vendors. Most multi-level marketing (tax is pre-paid) examples: Avon, Herbalife, Jafra, Mary Kay (Vendor should be able to show invoice to substantiate prepayment of tax if requested). Anyone not required to have a Seller’s Permit issued by the State Board of Equalization (see information above). For anyone selling household garage sale merchandise for the first or second weekend in a 12 month period. All vendors must show either a current Seller’s Permit issued by the California State Board of Equalization OR must fill out the Temporary Seller’s Form. You can fill out and print the form by pressing the “Temporary Form” button below (please print 2 copies of this form), or we will provide you the form when you arrive at the market. If you are required to have the Seller’s Permit issued by the Board of Equaliztion, please be sure to have Denio’s address on it. Our address is 1551 Vineyard Road, Roseville, CA 95678. You can link to the State Board by clicking the “Seller’s Permit” button below.